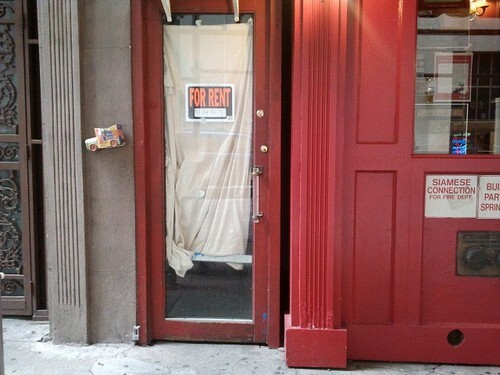 Tip of the hat to the intrepid Lunch’er who wrote in and said they had gone to Urban Lobster Shack on Stone St. only to find it no longer existed and there was a “For Rent” sign in the window of the door that led to the hallway of a shop. Indeed, when I investigated yesterday the only evidence that the purveyor of cheap lobster rolls ever existed was a tiny sign hanging from the scaffolding. I’m sure Luke’s Lobster opening a couple of blocks away didn’t exactly help business, but it’s still a little sad to not be able to get a lobster roll for less than $15 anymore. Posted by Andrea H at 9:30 am, July 20th, 2012 under Closed, Financial District, Urban Lobster Shack. 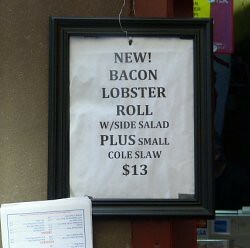 A couple of months ago, word reached ML that the Urban Lobster Shack in Midtown East had a lobster roll involving bacon. It turns out that the location on Stone St. (btw. Broad & Whitehall) also has this bacon lobster roll for $13, which is a couple of dollars more than the regular roll combo. It would appear it’s a roll with a strip of bacon inside, so whether that’s a good or bad addition is up to you to decide. I’m still a fan of their lobster scampi roll which is sounding pretty great in this warmer weather. Posted by Andrea H at 12:00 pm, March 14th, 2012 under Financial District, Sandwiches, Seafood, Urban Lobster Shack. Posted by Andrea H at 9:30 am, August 10th, 2011 under Financial District, Seafood, Urban Lobster Shack. Midtown workers shouldn’t have all the fun, so to even the score, I’ve brought on Daniel Krieger as an official Downtown Lunch Correspondent to write up some of the tasty stuff you can get in the lower half of Manhattan. This week, I gave Daniel permission to eat a $15 lunch because… well… I love lobster rolls. And aside from the one at the Red Hook in Fairway, it is pretty impossible to find a lobster roll for under $10. And, factoring in that for your $15 you also get a soup, cole slaw, chips, and water… well, it makes this one a no brainer. Yesterday I went to check out the new pizza truck downtown, eager with anticipation to try the grandma slice, but was shocked and dismayed to find the truck missing from its reported location in front of 2 Broadway. I even stopped two hungry looking brokers and asked them if they knew of this cart? “We actually just came out looking for it but it’s not where it was the past few days” they said. “Damn,” I said. Dejected and still hungry, I sulked around the area, hoping to turn a corner and see an orange-oil-stained-sidewalk in front of this alleged pizza truck. 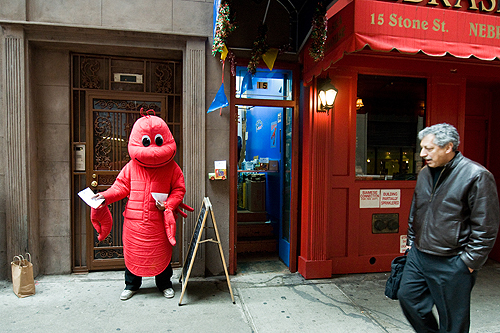 Instead I saw the next best thing, a grown man standing in a red lobster suit hawking lobster rolls. Posted by Daniel Krieger at 10:15 am, March 27th, 2009 under Financial District, Sandwiches, Seafood, Urban Lobster Shack.